Wide receiver Rod Streater fractured a bone in his neck in Sunday’s loss to the Chargers and will miss the season, ESPN.com’s Pat McManamon tweets. On the plus side, Streater will not need surgery and doctors expect him to make a full recovery. Streater was signed to a one-year deal last month following the Josh Gordon trade. The deal snapped a long layoff for the 30-year-old, who had not played in a regular season game since the ’16 season with the 49ers. Streater was on the roster for three games, but did not have a pass thrown in his direction. His final stat line with Cleveland consists of one carry for negative 11 yards against the Ravens. A 6-foot-2 pass-catcher, Streater’s most notable NFL work came with the Raiders many years ago. He caught 60 passes for 888 yards and four touchdowns with Oakland in 2013, doing so after surpassing 500 air yards as a rookie in 2012. In the seasons since, he hasn’t exceeded 300 yards combined. In related news, Browns rookie receiver Derrick Willies underwent surgery for his broken collarbone. But, unlike Streater, he is a candidate to return from IR later this year. Breshad Perriman has found a new home. ESPN’s Adam Schefter reports (via Twitter) that the wideout has signed with the Browns. To make room on the roster, the team is placing wideout Derrick Willies on the injured reserve (via Ohio.com’s Nate Ulrich on Twitter). 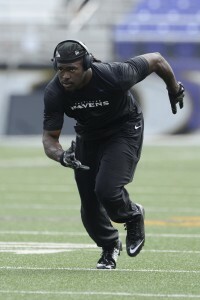 The 2015 first-round pick was released by the Ravens in September following three underwhelming seasons with the team. After sitting out his entire rookie campaign due to injury, Perriman managed to show a bit of promise in 2016, hauling in 33 catches for 499 yards and three scores. However, he seemingly took a step back in 2017, catching only 10 passes for 77 yards. The 25-year-old later caught on with the Redskins, but he was waived by the team before appearing in a game. A number of teams had taken the time to audition Perriman following his Baltimore and Washington stints, including the Eagles, Patriots, Jaguars, Jets, Giants, Bills, and Vikings. While the Browns had never been reported as a suitor, the pairing makes plenty of sense. The team’s receiver corps has been shaken up over the past few months, and they’re currently dealing with injuries to Rashard Higgins and Willies. While Perriman won’t pass Jarvis Landry or Antonio Callaway on the depth chart, he could earn some playing time over Rod Streater and Damion Ratley. We heard yesterday that Willies, an undrafted free agent out of Texas Tech, had broken his collarbone during practice (although Ulrich notes that he won’t be officially diagnosed until next week). The rookie had three receptions for 61 yards during last weekend’s win over the Ravens, and he was set to earn more playing time with Higgins sideline for at least the next two weeks.